Farro is the perfect filling for squash in my opinion and to dress it up I mixed in lemon mint and feta. The perfect light and summery combination. And to add just a little more flavor, I toasted some pine nuts and threw those in as well. What is it about toasting pine nuts that makes it 10x better than plain? 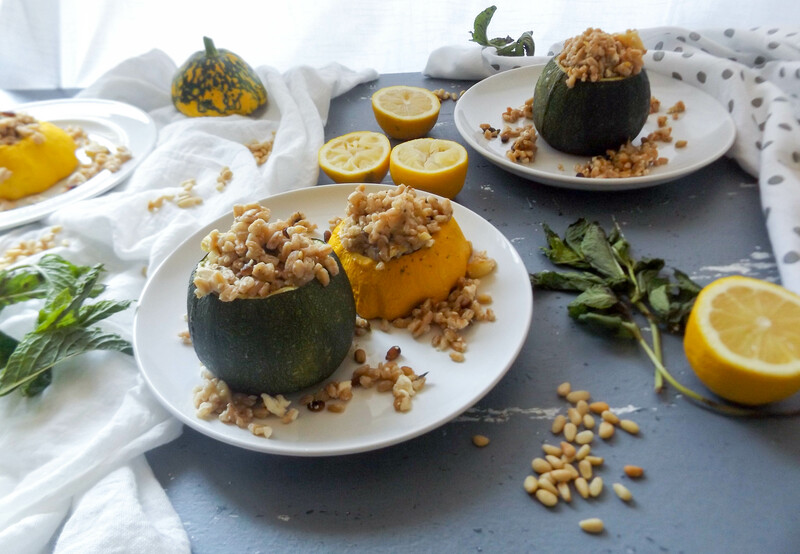 Cousa and patty pan summer squashes are twice as good stuffed with farro feta lemon and mint. Cut the top off the squash. With a spoon, scoop out the inside. Save for later. Place the squash on a baking sheet sprayed with cooking spray. Drizzle with olive oil, salt, and pepper. Cook in the oven for 30-35 minutes. With 8 minutes left, add some pine nuts to the baking sheet to lightly toast. This takes 5-8 minutes. In a small pot, add the farro and vegetable broth. Cook until broth has dissolved and farro is tender. 10-15 minutes. Cut the inside of the squash into cubes. In a small pan, add a little olive oil and the squash. Cook for 5-8 minutes. Add the mint feta, lemon juice, toasted pine nuts, and squash to the farro. Mix together. When the squash is out of the oven, stuff with the farro. I also added a little extra farro to the side of my plate.